The former royal palace was converted into a national museum after the Communists took over in 1975 and the royal family was sent to the re-education camps. Although it's been attacked numerous times over the centuries, the Phra Bang Buddha in Luang Prabang still stands strong as one of the most revered objects and popular tourist attractions in town; it's possible for visitors to get a tattoo from the monks at the Phra Bang temple. The Red Cross is one of the best and cheapest places to get a traditional, one-hour massage in Luang Prabang, with proceeds going to the organizations educational programs. Monsoon winds blow through Laos twice a year. They bring heavy rain in the summer months, but the humid climate and thick forests provide a great natural habitat for many animals, including the red panda. With its history permeated by conquests, Luang Prabang's peaceful feel betrays the city's past strife. At the convergence of two rivers, the Nam Khan and the Mekong, Luang Prabang is a charming and beautiful city set against a backdrop of green jungle and rugged mountain peaks. The earliest kingdoms around what is now Luang Prabang date to the seventh century, and the city played an important role in the political history of Laos as the regional capital until the official directive was moved to Vientiane in 1545. Despite the change, the city still remained a focus of many ruling parties in the surrounding area, and in 1887, Luang Prabang was attacked and destroyed by Chinese warlords, after which the French army offered its protection. Over time, the stucco and brick buildings that lend the city its colonial style were built, including the Royal Palace (pictured above). Also known as Haw Kham, the palace was built in 1904, with a mix of French Beaux Arts and traditional Lao motifs. Many French colonials migrated to the small city, even in the waning years of France's control over Laos, which ended in 1954. The last of the royal family in Luang Prabang was exiled in 1975, and the victorious Communist forces established the Lao Democratic People's Republic and essentially closed off the country to outsiders. Laos re-opened to tourism after the fall of the Soviet Union, in 1989, a shadow of its past self; the economy sagged and most of the aristocracy, intellectuals, and businesspeople had left the country. However, the legalization of private businesses sparked an economic resurgence—stores long since closed were reopening, new guesthouses and hotels emerged from rundown local houses and villas, lively art galleries began sprouting up, and handicrafts and restaurants took over sleepy street corners. Luang Prabang's international presence was greatly elevated in 1995, after becoming a UNESCO World Heritage site. The legends surrounding Luang Prabang include one where Buddha stopped to rest in the city, predicting that one day it would be an influential and prosperous capital city. Today the city is home to scores of practicing Buddhist monks, who have become the source of much attention as they take alms throughout the city early each morning as the sun rises. The surrounding mountains and rivers are also the base for tourists seeking outdoor adventure, as they're a great start for exploring the surrounding caves and mountains. These days, Luang Prabang is a quiet but beautiful city, and it's considered the showpiece tourist destination in Laos. Filled with splendid golden wats (temples), crumbling provincial architecture, local produce markets, and plenty of activity along the river, Luang Prabang lures travelers from around the region. It's reachable by bus from Vientiane, and most visitors who come begin with a stroll along the riverside and through the city's markets. Watching the monk's procession at dawn offers a glimpse into the rich culture of the area, and there are several other local sights you should not miss. 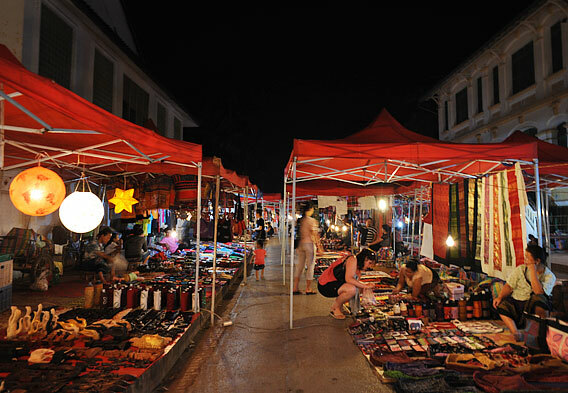 The thriving, colorful Night Market is the star on the shopping circuit in Luang Prabang. There are beautiful Laotian handicrafts, such as handmade quilts covers, pillow sets, and foldable hanging lamps, which can be bought for a great price. There are crafts made from endangered animals, so it's best to be cautious of souvenirs made from leather, ivory, talons, and other animal products. Located on Sisavangvong Road, the market is open until about 10 pm, and in addition to crafts, it offers excellent local dishes to try, such as barbecued fish. 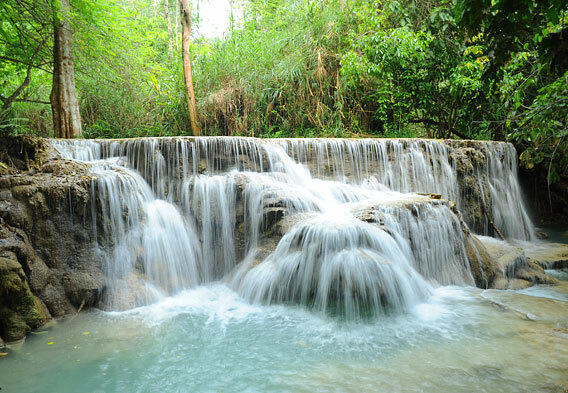 Kuang Si Falls, a renowned natural basin and important source of water for the city, is a stunning multi-stage waterfall located about 18 miles outside of Luang Prabang. There are multiple pools to soak in at different levels of the falls, and the setting is beautiful. Food and tourist stalls outside the falls area make this a popular place to spend a full day, and you can get there by hiring a truck or boat, or even renting a motorcycle and driving yourself. The Tad Sae waterfalls, also outside Luang Prabang, are another beautiful place to visit, though they aren't as large as Kuang Si. The mountains and rivers surrounding Luang Prabang are the base for tourists seeking outdoor adventure, and the nearby Pak Ou Caves, also known as the Cave Temples, are another of the best tourist attractions. 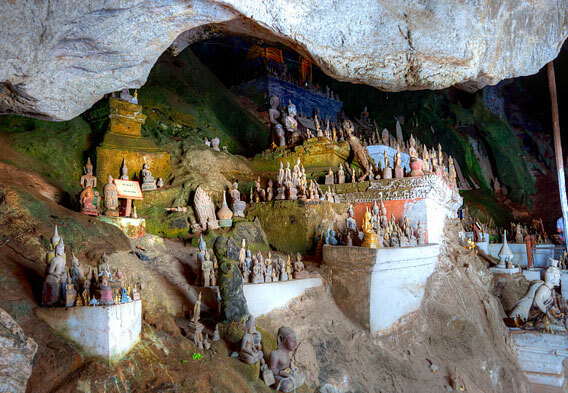 These caves are home to about 4,000 Buddha figures, large and small, put in the caves by local people, and they're easily reached by boat from Luang Prabang. There are two caves, one closer to the water level and the other on top of a hill at the end of a rather steep climb, but both of these limestone caverns are well worth exploring.